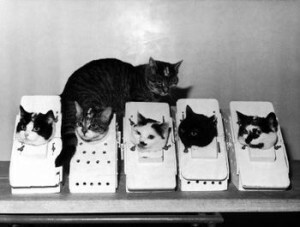 According to Monkeys in Space Web site NASA also sent cats into space....not just the French. Nothing makes the Grumpy Vegan fill with rage (well, actually, there’s quite a few things that makes the Grumpy Vegan fill with rage) than thinking about the animals we shot into space. Monkeys in Space is one of those quirky Web sites which someone with an obsession put together because they did not want us to forget that we shot animals into space. Which is why this is Web site of the Week. Otherwise, we forget. Only the French, methinks, could come up with the idea of sending cats into space. Felix francophobia or some such. This entry was posted in Animal Rights and tagged Animals in Research, Website of the Week. Bookmark the permalink.